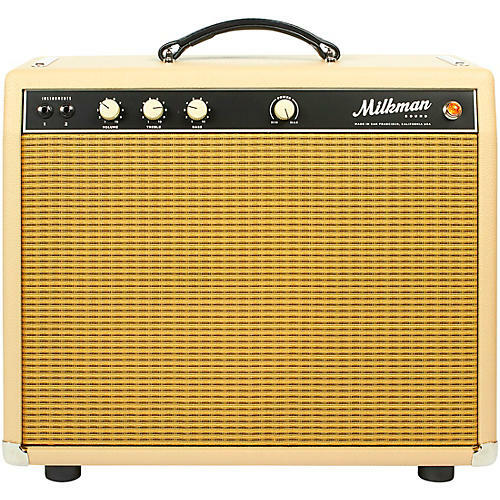 The Milkman One Watt Plus amplifier adds more to the popular One Watt model. More Power: The One Watt Plus has a pair of 6V6 tubes running in parallel for 10 watts of clean power, and 18 watts of harmonically rich overdriven power. Onboard power scaling drops the amp from 10 watts down to 1 watt so you can get the grind at bedroom volume with no change in tone. More Speaker: Available as a 12" combo, the One Watt Plus can move as much or as little air as you want it to. A bigger cabinet translates into more overall power. The Jupiter small magnet ceramic is transparent with a scooped sound. Upgrade to a Celestion Alnico Blue, and this amplifier becomes a rock box with added midrange focus and punch. More Class: The One Watt Plus has true Class A, single ended design. Both 6V6 power tubes run in parallel for a very dynamic and touch sensitive playing experience rich with even order harmonics. Like all Milkman amplifiers, the One Watt is hand-wired onto a turret board with Mercury Magnetics transformers and Jupiter Capacitors standard. It is build into a custom aluminum chassis and housed in a pine cabinet. Dimensions: 20" x 16" x 9.5"